Cape Town - It was a case of so close yet so far for the Southern Kings as they lost 34-30 to the defending PRO14 champions, Scarlets of Wales in a pulsating encounter at the Nelson Mandela Bay stadium on Sunday. The visitors opened the scoring as early as the 4th minute when prop Tadhg Beirne crossed the whitewash. Flyhalf Dan Jones added the conversion for a 7-0 lead. The Kings were on the board just four minutes later with Oliver Zono finding Michael Makase with a cross-kick which saw the winger go over in the corner for a try that Zono was unable to convert. The home side had the lead just six minutes later with left wing Yak Penxe collecting a grubber from Berton Klaasen to dot down for another unconverted try and a 10-7 lead. Zono added two further penalties during the half with Jones kicking one for Scarlets to see the Kings lead 16-10 at half-time. The Kings extended their advantage early in the second thanks to a try from centre Martin du Toit with Zono added the conversion to take the score out to 23-10. The Scarlets hit back 8 minutes later as quick hands saw winger Ioan Nicholas over for a converted try as the visitors cut the Kings lead to 23-17. Scarlets were in front the 56th minute thanks to a try from flanker Werner Kruger which Jones converted to push the score out to 24-23 in favour of the visitors. Jones then extended the lead to 27-23 with a penalty in the 61st minute. 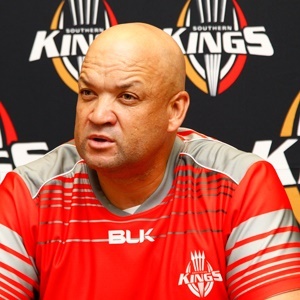 The Kings, however, came roaring back and were once again in front thanks to Harlon Klaasen who pounced on a Scarlets error to kick the ball through and dot down. The home side now led 30-27 thanks to replacement flyhalf Kurt Coleman slotting the conversion. In the 70th minute, Scarlets were back in front again as flyhalf Jones sniped over from in close for a converted try and a 34-30 lead. And that's how it ended with the Kings desperately trying to find a winning score but unable to. 15 Johnny McNicholl, 14 Tom Prydie, 13 Steff Hughes, 12 Paul Asquith, 11 Ioan Nicholas, 10 Dan Jones, 9 Jonathan Evans (captain), 8 Dylan Evans, 7 Ryan Elias, 6 Werner Kruger, 5 Lewis Rawlins, 4 David Bulbring, 3 Tadhg Beirne, 2 Will Boyde, 1 Josh Macleod. Substitutes: 16 Taylor Davies, 17 Rhys Fawcett, 18 Simon Gardiner, 19 Tom Price, 20 Jack Condy, 21 Mike Phillips, 22 Ioan Hughes, 23 Morgan Williams.